Some gem-quality labradorite phenocrysts in Miocene basaltic lava from Lake County, Oregon, have a pink schiller due to metallic copper; some have a transparent red or green color. The copper content of the crystals vsries systematically with color: pale-yellow lalradorite sections have 0-40 ppm CuO; greens have about 100 ppm CuO; reds have 150 to 200 ppm CuO; schiller-bearing laths have 80 to 300 ppm CuO. The variation of Cu content among different crystals is primary and reflectss a variation in magma chemisty during plagioclase fractionation. 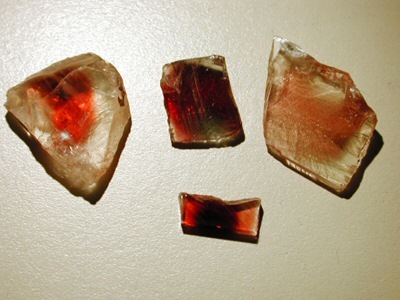 Similarity of absorption spectra of the red zones to that of copper-ruby color in glass shows that the red arises from the intrinsic absorption of colloidal Cu0 particles that are too small to scatter light (<22 nm). 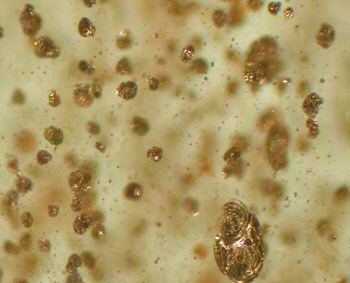 Particle size depends on Cu content because the temperature at which copper begins to exsolve from feldspar increases with Cu content and the higher temperatures promote diffusion. At 900 to 1100 °C the reduction of Cu is controlled by reactions in the basalt that keep fO2 near the QFM buffer. 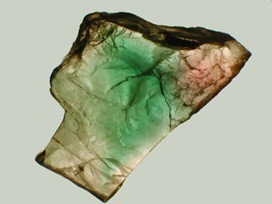 The green color may be caused by either Cu1+/Cu0 IVCT or Cu0 pairs. 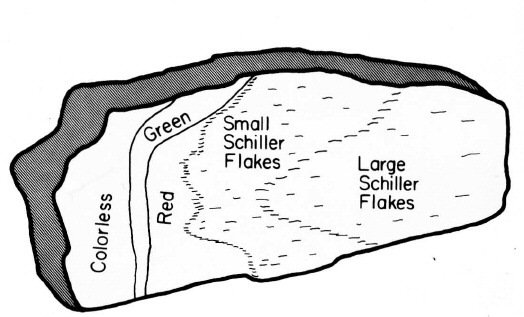 Different zones of color in Lake County labradorite.